Madagascar is in the grip of harsh climate change and after five years of extreme drought in the south it's now enduring a chronic food crisis. When the El Niño climate phenomenon hit the African island state in 2016 the outlook for farming worsened. Growth has now flatlined in the low income country and 1.3 million people in the south are severely food insecure, with some only one step away from famine. Last year the UN's Office for the Coordination of Humanitarian Affairs reported that 20,000 children were acutely malnourished. When this happens a child's body breaks down fat and muscle to survive, its metabolism slows and its immune systems weakens. Illness and stunting are then waiting in the wings and there's little likelihood of a child managing to get to school or concentrate in class. This year there was a "normal" rainy season in the south, the first in five years - an increasingly rare occurrence in the face of unassailable climate change. But the dry season is the harsh one. "During the dry season, my children and I eat only red prickly pears for breakfast, lunch and dinner," one mother told Euronews on a trip to the far southern district of Beloha. A whole population of farmers in the Beloha are waiting for the crops to grow, after being brought to their knees with little to eat. In this situation handing out hard cash is the quickest and most effective way to help; people can then immediately buy maize, cassava and rice, their staple foods. The UN's World Food Programme, financed by ECHO, the EU's humanitarian agency, is now supporting hundreds of thousands of people in two southern districts this way. Each family receives 70,000 Ariary per month, around 17 euros, for five months. The UN agency has managed to join forces with the national social protection system, meaning more people are reached and in a more effective way. "WFP aims to support around 846,000 beneficiaries," the World Food Programme's Maman Bachir Yacouba told Euronews, adding that 500,000 have been reached so far in area where 80 per cent of the population is affected by drought. The cash families receive is meant to provide them with half of the food they need each month, with the expectation that they can provide the other half by themselves. For one mother it's the only way she can afford to buy rice and meat more regularly for her five children, one of whom suffered malnutrition. "We were forced to sell one part of our plot. I started selling clothes and tools. I continued like that until I had given everything away. Even my clothes. What I am wearing now was lent to me. With the cash I am receiving, my family is starting to recover," Delina told Euronews. The EU started financing WFP in 2016 after El Niño hit and this is how it came to set up a cash transfer system that can now be quickly triggered in case of an emergency. "Last October, when we realized the extent and the severity of the crisis, the EU unblocked two million euros, which allowed WFP to organize a cash transfer in December and another one in January for the poorest populations and the most hit districts," Anouk Delafortrie from the EU's humanitarian aid operations told Euronews. "We need to link the humanitarian sector to development actors so that they can give the population the means to become more resilient to these climate hazards," she added. The Nikoly health centre is among some 200 centres backed by UNICEF with EU funds. Among the dozens of patients there is Jean Aimé, 17 months old and just five kilos - half the normal weight of a child of his age. "We follow them for eight weeks, if they don't get better they are referred to the intensive nutritional stabilization centre," the head nurse at the centre, Dieudonne Tside, said. The challenge is enormous however: last year’s staple crop production was down by a massive 60 per cent, and it hit children the worst. 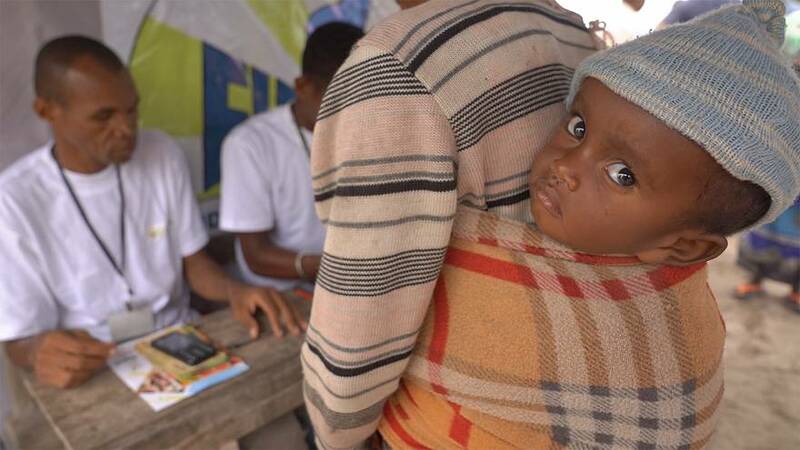 Sadly nearly half of Madagascar's children are now stunted, according to UNICEF, the UN's child agency.